The Geneva Motor Show is in full swing, and Audi is debuting the A3 Concept, a preview of its next-generation A3. Right now, the brand’s sales momentum looks to only be building, with a record year globally in 2010 and continued gains for the month of February. The entire lineup appears to be poised well for future success. One area Audi has looked to expand is downmarket, with the A1 debuting in Europe. That car isn’t coming to the United States though – for now the A3 will remain the smallest Audi. As a five-door hatchback, the A3 hasn’t caught on here. 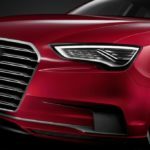 The small-premium segment is growing in the U.S though, and Audi is looking to compete with a proper four-door sedan A3. 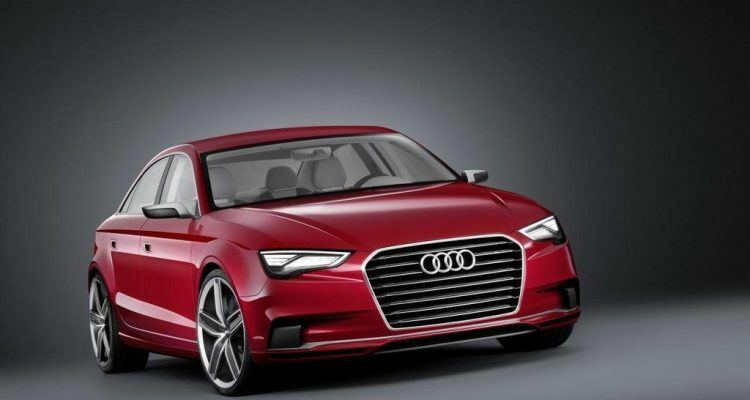 The A3 Concept looks to offer a good preview of the (a pretty insane!) next-generation RS3, based on its specifications. Rather than a hybrid or an engine with a more conservative power output, the A3 Concept is powered by a five-cylinder TFSI unit. TFSI means turbocharging and direct injection, and utilizing this technology the engine produces 408 horsepower and 368 pound feet of torque. Whoa! In the compact and lightweight A3, it is powerful enough to scoot the car to 0-62 mph in 4.1 seconds. We guarantee the A3 won’t come standard like that! As for the styling…..ding ding! We have a winner. The proportions just work perfectly with the design of the A3 Concept. Audi’s look is well known by now and overall, they haven’t messed with the formula drastically for this car. It is for good reason though – it has been highly successful. 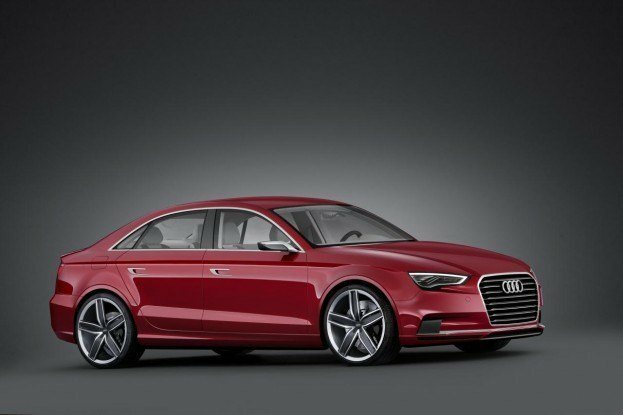 What’s more, the brand’s design language has never looked better on a sedan than right here on the A3 Concept. The A3 Concept has a very athletic stance and planted presence. Up front, the large, floating grille dominates, flanked by aggressive inset headlights. The rear end has a sloping, coupe-like roofline with a notchback trunk. The car’s lines convey motion and its sporting intentions. There is a prominent rising side body line that continues to the rear end where it wraps around with a large bumper. A key part of Audi’s styling language has been a stand out lighting package, and the A3 debuts a further evolution of what has been done. 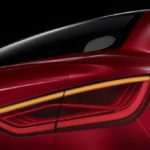 Like the recently-introduced A6, the car shows an amber LED turn signal in the front and rear headlamps. 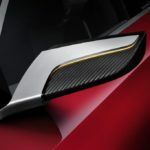 There are also unique details on this car, such as carbon fiber mirrors with an LED turn signal swoosh and door handles with an unconventional design. Hopefully some of these elements won’t be concept-only and will make it to the production A3. Interior design is an area where Audi has explored different themes lately. 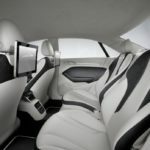 Audi interiors are known for their quality craftsmanship and design, and the latest ones from the brand look to be no different. The A7 Sportback and A6 have debuted low, horizontal and driver-focused layouts. 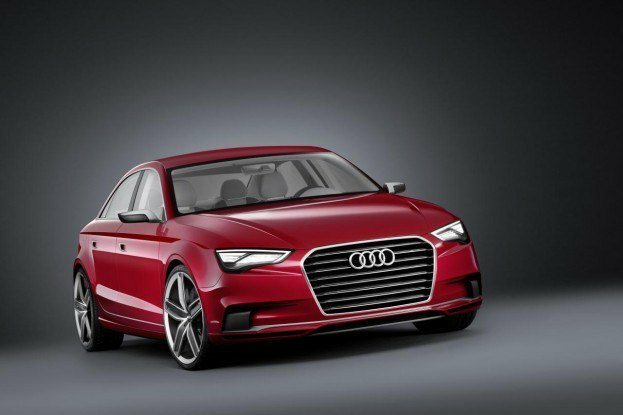 The A3 Concept mixes things up a bit. While it has a horizontal design, it shares more with the A1 sedan, which has a bit of a retro-feel. That means round vents with chrome details – something the current A3 also has. It appears as if Audi uses the rounded vents on its lower-end or more sport-intentioned models, which makes sense. With the A3 Concept, the emphasis is definitely toward the sport end of the spectrum rather than luxury. Perfect for what is likely to be a young target demographic with this car. With the growing premium small car segment set to be a major battleground in the future, Audi’s future looks in good hands with next-generation iteration of the A3. 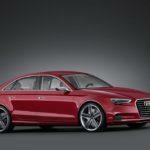 1 Comment on "Audi A3 Concept Previews Next-Generation A3"